H.L. Burke is well on her way to becoming the next Dragon Lady. Her first series, The Dragon and the Scholar (first book is free here), followed the relationship between a cursed dragon and the woman he loved. Cora and the Nurse Dragon is a fun read. Cora lives in a world where dragons are common pets – for those who can afford them. She dreams of racing dragons one day but is stuck raising cheap, tiny mayfly dragons who only live a few months. 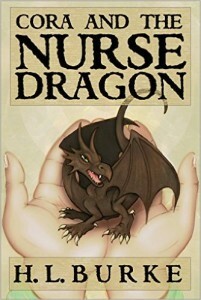 Her luck changes when her nemesis throws an egg at her, which hatches into a rare nurse dragon with a very unique ability. While I enjoyed this book as an adult, it’ll definitely appeal to its target audience of kids. Cora and her best friend Abry strike a fine balance between following and breaking rules, between independence and reaching out to the adults in their lives for help. They find a way to deal with bullies, as well as higher issues of what makes a law moral. The climax is darker than I expected, but nothing kids can’t handle. Overall, it’s a great clean read for kids with some good messages along the way. Even though the story only takes place over the span of a few months, Cora manages to grow quite a bit throughout the story, as evident by the choices she makes at the end and her reasoning for them. Because of this, the song this week is AOLNATION’s “Kill Your Heroes.” Because sometimes, what you thought you wanted isn’t the right choice at all.